Wow, what a beauty! This Taft-Sherman jugate is a rare item with breathtaking design. 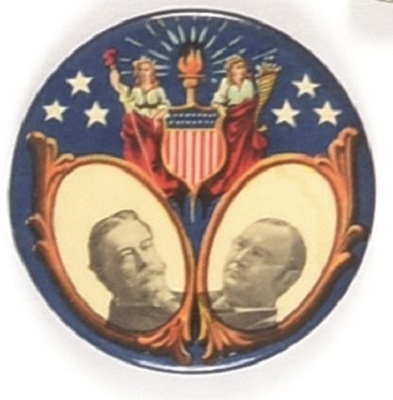 Bill and Jim are pretty much overshadowed by the ornate and colorful design that features a shield and a pair of Lady Liberties. A simply beautiful pin seldom seen in auctions. It’s a 1 3/4 inch celluloid in excellent condition.